in the neighborhood of Inwood on the northern tip of Manhattan. Henshaw Street runs between Dyckman Street and Riverside Drive. It is sandwiched between Fort Tryon Park (home of the The Heather Garden and The Cloister Museum)to the south, and Inwood Hill Park to the north. A train to Dyckman Street/200th. Exit @ intersection on Broadway/Dyckman/Riverside Drive. Walk west on Riverside Drive or Dyckman Street, (both are perpendicular to Henshaw Street.) then turn onto Henshaw Street. 1 train to Dyckman Street. Walk west on Dyckman. (Then follow directions above). which will put you onto Riverside Drive. Turn left at the first traffic light which is Henshaw Street. 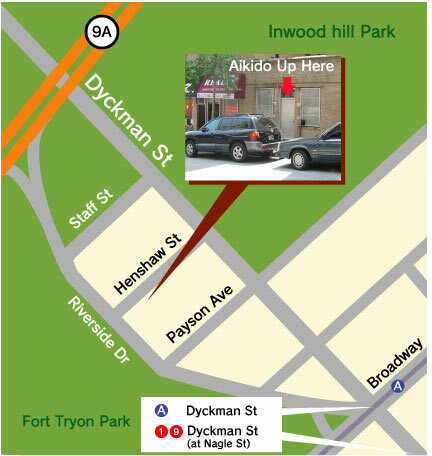 the Dyckman Street exit, exit #17. Turn left onto Dyckman Street. then right onto Riverside Drive and then right onto Henshaw Street (first traffic light). turn right on Henshaw Street.